Sign up to have Safety Compass delivered right to your inbox! New Roadway Lighting Database Available In July! 2016 National Work Zone Awareness Week "Don't Be THAT Driver"
It is such a fundamental aspect of our American culture that we take it for granted: we are all different, but we become one by working across our differences and pulling together to focus on reaching a single, unified goal. For us transportation safety professionals, that goal is zero deaths. We cannot pay for our mobility with lives. Improving safety and reaching zero requires us to work across disciplines, across levels of government, and across public and private sectors. We must innovate in terms of solutions and partners. The transportation industry faces constricted resources, reduced staffing, and a sometimes challenging political climate, making the need to combine our talents and share our successful approaches even more critical. As we continue to work with long-term partners, we will also seek out new collaborations as we advance step by step toward our shared goal. Using a collaborative approach, we can leverage knowledge and skills from across the FHWA and USDOT; from other Federal agencies; from our colleagues at the State, county, and local levels; and from planning bodies, tribes, enforcement agencies, and stakeholder groups. This issue of Safety Compass contains a variety of articles that highlight partnership and collaboration, ranging from recent peer exchanges where attendees shared important lessons from rumble strip installation projects (page 4), to involving tribes in the SHSP update process (page 7), to opportunities to work with peers on a pooled fund study (page 16), to name just a few. We hope you find this issue informative, and that you take advantage of the contact information we provide with each article to learn more about how your peers can help you to improve safety on every roadway in our Nation. The FHWA published the Highway Safety Improvement Program (HSIP) Final Rule in the Federal Register on March 15, 2016, with an effective date of April 14, 2016. The HSIP Final Rule updates the HSIP regulation under 23 CFR 924 to be consistent with MAP-21 and the FAST Act and to clarify existing program requirements. The HSIP is a core Federal-aid program the purpose of which is to achieve a significant reduction in fatalities and serious injuries on all public roads. The States receive over $2.4 billion in HSIP funding each year to implement highway safety improvement projects using a data-driven, strategic approach that focuses on performance. The HSIP Final Rule pre-scribes the requirements for the development, imple-mentation, and evaluation of an HSIP in each State. What are the major provisions of the HSIP Final Rule? The HSIP Final Rule contains three major policy provisions related to the HSIP report content and schedule, the Strategic Highway Safety Plan update cycle, and the subset of the model inventory of roadway elements, also known as the MIRE fundamental data elements. The HSIP report schedule remains the same: the HSIP and Railway-Highway Crossing Program (RHCP) report are due on August 31st each year. However, all States are now required to use FHWA's online reporting tool to submit their annual reports. In addition, the HSIP Final Rule requires States to describe their progress in achieving safety outcomes and performance targets in the HSIP report. This provision requires States not only to document their safety performance targets in their annual HSIP report, but also to include a discussion of the basis for each established target and how the established target supports the long-term SHSP goals. FHWA will update the HSIP reporting guidance and online reporting tool to align with these new reporting requirements for the 2017 reporting cycle. The HSIP Final Rule requires States to update their SHSP at least once every 5 years, consistent with the current state of the practice. For those States that do not already have a MAP-21 compliant SHSP with a process approved by the FHWA Division Office, the first SHSP update is due no later than August 1, 2017. Other new features include a requirement for each State to document its implementation process, including actions that address more specifically how the SHSP emphasis area strategies will be implemented, and to evaluate the SHSP as part of the State's SHSP update process. More information about SHSP requirements can be found in the revised SHSP Guidance dated March 14, 2016 available at http://safety.fhwa.dot.gov/legislationandpolicy/fast/shsp_guidance.cfm. The most significant new requirement of the HSIP final rule is for States to collect and use the MIRE fundamental data elements on all public roads to support enhanced safety analysis and safety investment decision making. The HSIP final rule establishes three categories of MIRE fundamental data elements based on roadway functional classification and surface type. States must include a strategy that incorporates specific, quantifiable, and measurable anticipated improvements for the collection of the MIRE fundamental data elements into the State Traffic Records Strategic Plan by July 1, 2017. The collection of the MIRE fundamental data elements on all public roads must be complete by September 30, 2026. The revised Guidance on State Safety Data Systems, dated March 15, 2016, includes additional information on the MIRE fundamental data elements (see related story below) and can be found at http://safety.fhwa.dot.gov/legislationandpolicy/fast/ssds_guidance.cfm. Become familiar with the new HSIP requirements. Review the HSIP Final Rule in the Federal Register at http://www.regulations.gov (docket number FHWA -2013-0019). The Federal Register notice summarizes the docket comments, FHWA's response to those comments, and the changes between the notice of proposed rulemaking and the final rule. The Federal Register notice also includes the revised regulation text. All States should review and update their existing HSIP processes to ensure consistency and compliance with the HSIP final rule. Shortly after publishing the Final Rule, FHWA sponsored a webinar to discuss its requirements. A re-cording of the webinar and slides are available at: http://safety.fhwa.dot.gov/hsip/rulemaking, as are a fact sheet and links to other resources to support implementation of the HSIP Final Rule. States should also begin taking immediate steps to meet the specific deadlines and requirements related to submitting the annual HSIP and RHCP reports, updating the Strategic Highway Safety Plan, and collecting and using the MIRE fundamental data elements, as summarized in the table below: What additional resources are available to support implementation of the HSIP Final Rule? FHWA updated the HSIP MAP-21 guidance documents to reflect the new requirements in the HSIP Final Rule and the FAST Act. The updated guidance documents are available at http://safety.fhwa.dot.gov/legislationandpolicy/fast/. FHWA will also issue supplemental guidance to support implementation of the HSIP and Safety Performance Measures Final Rules. The HSIP implementation guidance relates existing guidance and information resources to the various elements of the HSIP and Safety Performance Measures final rules and establishes new guidance where needed. In addition, FHWA offers free assistance on policy, program, and technical issues to State and local roadway agencies through the Office of Safety's technical assistance program. For additional information, contact your local Division office or visit http://rspcb.safety.fhwa.dot.gov/technical.aspx. All information related to the HSIP Final Rule and the Safety Performance Measures Final Rule can be found at http://safety.fhwa.dot.gov/hsip/rulemaking. August 31, 2016 Use the HSIP online reporting tool to submit the State annual HSIP and RHCP reports. With motor vehicle related fatalities on the rise for the first time in several years, the Safety Performance Management Measures (Safety PM) Final Rule comes at an important time. The performance measures provide States and metropolitan planning organizations (MPOs) with a framework for becoming more effective and will change how FHWA's $2.3 billion HSIP is managed. As Federal, State, and local partners work together to implement this rule, we will achieve improved coordination, make better data-driven decisions, and, most importantly, save more lives. Establish five performance measures that States and MPOs must set targets for the 5-year rolling averages for: (a) number of fatalities, (b) rate of fatalities per 100 million vehicle-miles traveled (VMT), (c) number of serious injuries, (d) rate of serious injuries per 100 million VMT, and (d) number of non-motorized fatalities and non-motorized serious injuries. Institute a process for State DOTs and MPOs to use to establish and report their safety targets. States set targets annually and have the option to set urbanized area targets and one target for non-urbanized areas. Three of the targets must be identical to the National Highway Traffic Safety Administration's (NHTSA) targets, which are the number and rate of fatalities and the number of serious injuries. MPOs are required to set targets within 180 days after the State sets its targets. MPOs can either support the State target or establish a numerical target specific to the MPO planning area. MPOs can select either option for each safety performance measure. Institute a process for FHWA to assess whether a State has met or made significant progress toward meeting its safety targets. FHWA will determine whether a State has met or made significant progress toward meeting its targets when at least four of the five targets are either met or the actual outcome for the target is better than baseline performance. Only the five performance measures are included in the significant progress determination. Optional urbanized and non-urbanized targets for States and targets for MPOs are not included in the significant progress determination. If a State is not successful in meeting or making significant progress during an annual assessment, the State is required to use certain safety funds only for HSIP projects and submit an HSIP Implementation Plan to FHWA. Lastly, the Safety PM Final Rule establishes for the first time a national definition for serious injuries. Currently, States are using different definitions and coding conventions to report serious injuries in their motor vehicle crash databases. However, by April 14, 2019, all States must use the definition for "Suspected Serious Injury (A)" from the Model Minimum Uniform Crash Criteria (MMUCC), 4th Edition. NHTSA has developed conversion tables to report the number of serious injuries consistent with the new definition until States comply with the MMUCC definition. The new requirements require stakeholders to collaborate more closely than ever before. State DOTs, MPOs, State highway safety offices, and a host of other safety stakeholders should begin conversations now on the new requirements, which became effective on April 14, 2016. States and MPOs are required to begin setting safety targets for calendar year 2018. The FHWA Office of Safety hosted six virtual peer exchanges on the topic of rumble strips between October of 2015 and February of 2016. Each peer exchange included groups of 7-10 States (and Federal Lands Highway offices) and was intended to bring peers together through videoconference technology, enabling them to discuss implementation strategies for this life-saving countermeasure. Pavement and maintenance engineers to discuss the best practices for maintaining the integrity of our pavements and how to maintain the safety effectiveness of the rumble strips when they are overlaid. Noise specialists, along with those who respond to citizen complaints about noise, to discuss techniques and practices that address the noise concerns of residents who live near rumble strip treatments. Bicycle/pedestrian coordinators and other planners to provide insight into the specific needs of the wide array of non-motorized road users traveling on the Nation's roadways. Not surprisingly, there is considerable variation in policies and standards from State to State, just as there is much variation in the geometry of roadways, topography, and the built environment across our Nation. Traffic mix also varies by location; for example, Colorado DOT has placed a bicycle traffic counter on the shoulder of one corridor on which bicycles are approximately 10% of the traffic volume. The agency is considering installing counters in additional locations notable for higher rates of bicycle traffic as well. Other user considerations discussed include trucks, over-sized farm equipment, and Amish buggies. A number of other interesting and important pieces of information and lessons have already been shared on a wide range of topics. For example, an attendee at the first peer exchange, Michigan Pavement Construction Engineer Curtis Bleech told colleagues he was initially very concerned when MDOT leadership decided to place rumble strips extensively on their system, but took advantage of the effort to strengthen the agency's longitudinal joint specifi-cation. After 5,400 miles of center line rumble strips were placed on two-lane, high-speed highways over 3 years, a cursory review of the pavements determined that joint problems were only exacerbated when there was an existing problem at the joint. Further analysis of pavement sections with and without rumble strips suggest that rumble strips did not create adverse impacts on pavement performance in the short-term (see Michigan DOT, Impact of Non-Freeway Rumble Strips Phase 1, RC-1575 (Lansing, MI: 2012), p.47. Available at: http://www.michigan.gov/documents/mdot/MDOT_Research_Report_RC1575_Report_394019_7.pdf.) In addition, MDOT has determined fatal and injury target crashes were reduced by 47 percent (see Michigan DOT, Evaluation of Non-Freeway Rumble Strips Phase 2, RC-1627 (Lansing, MI: 2015). Available at: http://www.michigan.gov/documents/mdot/RC1627_489159_7.pdf). Now, Curtis is a proponent of rumble strips. Another issue that has come to light is that some agencies are fog sealing over the rumble strips, which requires an extra operation at extra cost and results in the need to wait longer to reapply pavement markings. No studies have been completed to clearly indicate whether this extends the life of the pavement, however, a few States have conducted informal reviews and discontinued the practice. During the peer exchanges, attendees expressed a great deal of interest in the current research into sinusoidal rumble strips, which is underway in several States. Caltrans and MnDOT have done the most extensive work, and both think it shows great promise in reducing noise external to the vehicle while continuing to provide warning to the driver. Another topic of interest was determining how rumble strips of smaller dimensions or different designs (e.g., raised versions) may affect crash modification factors. Several States are using design flexibilities to install modified designs to fit specific location conditions, with the general belief that they will provide crash reductions similar to those found with the larger, milled designs that have been studied. Participants also showed great interest in research to determine if there is a difference in safety benefits among the different designs. 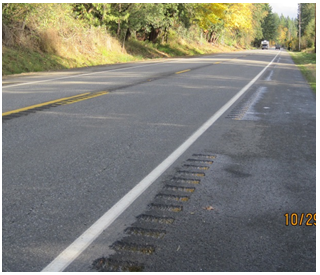 Several State DOTs are now expanding the use of rumble strips to local roads to help reduce fatal and injury crashes. Mark Borst, Traffic Engineer from Kansas' Sedgwick County Public Works, showed some examples of both center and edge line rumble strip installations made under a Highway Safety Improvement Program (HSIP) project. New Jersey has also expanded its center line rumble strip implementation to cover much of the local system. Several States promote the use of rumble strips on appropriate county roads based on crash data or on corridors with characteristics that tend to be overrepresented in run-off-road or cross-center-line crashes. The peer exchanges further revealed that additional flexibility in the design of rumble strips is often necessary to fit the specific location on local roads. As part of the peer exchange, FHWA provided participants a file that compiled the policy/guidance and drawings of each of the participating states. Although it is only a snapshot, in time we hope to find a way to make these available to all interested practitioners. FHWA will be developing a final report regarding the peer exchanges that will be posted on our Roadway Safety Capacity Building website at http://rspcb.safety.fhwa.dot.gov/technical.aspx#reports when it is available. For more information on technical assistance or peer-to-peer events related to rumble strips, contact Cathy Satterfield at Cathy.Satterfield@dot.gov. In 2013, there were 5.7 million crashes reported in the United States, including 32,719 fatalities and more than 2.3 million injuries (NHTSA, 2014). More than half of the 2013 fatalities occurred as a result of roadway departure crashes. Vehicles are more likely to leave the travel lane of a roadway where the roadway alignment changes direction. These locations are known as horizontal curves. Several studies1 have shown that the average crash rate for horizontal curves on two-lane rural highways is three times higher than that for a tangent section. In addition, the severity of roadway departure crashes on horizontal curves is also higher than that for roadway departure crashes on tangent segments. Reduce the likelihood of a vehicle leaving its lane and either crossing the roadway centerline or leaving the roadway at a horizontal curve. Minimize the damaging consequences of a vehicle leaving the roadway at a horizontal curve. Although the NCHRP report provides information about each strategy, transportation professionals indicated that a document providing practical information on where, when, and how to apply a safety countermeasure or design feature – including examples and costs – would be valuable to local road agencies. In response, FHWA developed the Low-Cost Treatments for Horizontal Curve Safety (McGee and Hanscom, 2006). However, there have been many advances in highway safety since the 2006 guide came out, so this year FHWA issued the updated Low-Cost Treatments for Horizontal Curve Safety 2016. As with the earlier edition, the primary audience for the 2016 update is local transportation agencies. This publication primarily includes those engineering countermeasures that are relatively low-cost, such as signage and pavement markings. More moderate or higher cost treatments, including varying degrees of infrastructure changes, are also provided and address superelevation, cross section, and shoulder adjustments, among others. This newly updated resource will help transportation agencies and their construction crews understand the available countermeasures and how to select and apply them. The topics addressed in the updated publication include a brief description of site analysis and the systemic approach to site selection, markings, signs, pavement countermeasures, roadside improvements, and addressing intersections at curves. The updated report also includes an appendix with case studies illustrating various safety countermeasures deployed by State DOTs as well as a discussion of the safety policies adopted by State DOTs. 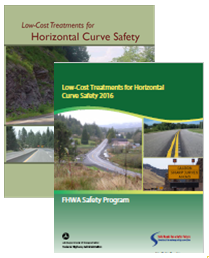 Low-Cost Treatments for Horizontal Curve Safety 2016 is now available for viewing or download at http://safety.fhwa.dot.gov/roadway_dept/horicurves/fhwasa15084/. For more information on FHWA's Roadway Departure Safety Program and horizontal curve safety resources, visit http://safety.fhwa.dot.gov/roadway_dept/ or contact Cathy Satterfield at Cathy.satterfield@dot.gov. 1 See K.M. Bauer and D.W. Harwood, Safety Effects of Horizontal Curve and Grade Combinations on Rural Two-Lane Highways, FHWA-HRT-13-077 (Washington DC: FHWA, 2014); J.E. Hummer et al., "Curve Crashes: Road and Collision Characteristics and Countermeasures," Journal of Transportation Safety and Security 2(2010): 203-220; also, J.C. Glennon, T.R. Neuman, and J E. Leisch, Safety and Operational Considerations for Design of Rural Highway Curves, FHWA-RD-86-035 (Washington, DC: FHWA 1985). Many States and tribes are working together to reduce roadway injuries and fatalities in tribal communities. These efforts include collaborating during the State Strategic Highway Safety Plan (SHSP) process to bring together a diverse group of stakeholders, identify road safety challenges, and find solutions. FHWA's Noteworthy Practices Database (located at: http://rspcb.safety.fhwa.dot.gov/noteworthy/Default.aspx) recently added practices for four States that have collaborated with tribal governments before, during, and after the SHSP process. Approaches and benefits from Washington, Montana, South Dakota, and North Dakota are highlighted below. Washington's Centennial Accord (http://goia.wa.gov/Relations/Relations.html) is the foundation of the collaborative environment for transportation and traffic safety efforts between tribes and the State of Washington. Signed in 1989, the Accord established government-to-government relations between the State and tribes, in an effort to resolve disagreements before they reached the courtroom. That framework of collaboration was applied to enhance tribal involvement in traffic safety planning. The Centennial Accord gives State agencies a protocol for officially interacting with tribes, including having a tribal liaison. Washington transportation officials connect with tribal committees, boards, law enforcement groups, and planning organizations during SHSP updates to engage representatives from the 29 federally recognized tribes in Washington. Traffic safety boards and organizations provide a framework for communicating with tribal staff involved with the "4Es" of highway safety: education, enforcement, engineering, and emergency medical services (EMS). State and tribal planners in Montana share information and strengthen personal relationships during safety summits. In the lead-up to the Montana Comprehensive Highway Safety Plan (CHSP) update in 2014, State and tribal representatives collaborated on and conducted four safety summits. These summits were hosted by tribes in Montana, with rotating sponsorship each year to encourage tribal ownership over road safety best practices. Tribes also host summits and meetings in South Dakota. Meetings often include FHWA division staff, representatives from the Bureau of Indian Affairs, the South Dakota Departments of Transportation (SDDOT) and Public Safety, tribal historic preservation officers, tribal chairs and presidents, and sometimes council members. This year, SDDOT will hold its 6th Tribal Trans-portation Safety Summit (visit http://www.sddot.com/ services/civil/tero.aspx for more information) The event will be hosted by the Standing Rock Sioux Tribe. The summit is an opportunity for State and tribal representatives to build relationships and to bring together representatives from the 4Es. Before South Dakota completed its most recent SHSP update in 2014, SDDOT presented its draft SHSP at the Tribal Safety Summit to get input on how to integrate tribal road safety needs into the SHSP. Tribes were eager to provide feedback, and asked if SDDOT would be at the table–to provide technical assistance, data, and answer questions–as tribes created their own road safety plans. North Dakota is a State with a small population and a prominent tribal culture. For decades, NDDOT has collaborated on road safety with tribal representatives. The established relationships between tribes and NDDOT made it relatively easy to incorporate tribal needs into the 2013 SHSP update. In addition, North Dakota's Local Road Safety Program (LRSP) has facilitated communication with tribal governments to ensure that tribal needs are reflected in selected projects. Despite this, data quality is a persistent challenge in reaching safety planning goals. Only one out of the four tribes in North Dakota has equipment compatible with the State's electronic crash reporting system. The State is exploring options for improving the ability of tribes to access and use data in project planning and selection. Data-sharing is also a challenge in Washington State, where State and tribal planners need crash data on tribal roads to make the case for Federal and State grant money. But there are barriers, including staffing issues and finding the resources it takes to process data. To help, the Washington Traffic Safety Commission funded an ongoing project that allows each tribe's crash codes to be uploaded automatically to the State's electronic ticketing and crash reporting system. In Washington, tribes gain increased awareness about the importance of addressing roadway safety, and they take ownership of the final SHSP plan. With ownership, tribes are more likely to use the SHSP as a guide and source of information for their own transportation plans. Tribal planners, enforcement, and EMS become familiar with target zero strategies, which can be valuable when applying for State grant funding. In addition, Washington's data on behavioral factors in fatal and serious injury crashes is now more complete and accurate. In Montana, tribal involvement brings the entire State population closer to a cohesive vision zero goal: zero fatalities, zero serious injuries. Tribal issues and strategies are integrated into Comprehensive Highway Safety Plan (CHSP) emphasis areas, and there has been a downward trend in AI/AN fatalities. Participation from tribal safety representatives also helps builds trust between State agencies and tribal governments. In South Dakota, tribal involvement ensures that tribal concerns and strategies are addressed in the SHSP. Close coordination with tribes has led to broad support of the annual traffic safety summit. The safety summit is a vehicle for SDDOT staff and tribal representatives to interact, and for tribes to share low-cost safety improvements. SDDOT staff also make a point to be available to help resolve any road safety or general transportation issues. In North Dakota, ongoing coordination and collaboration is a success that begets success. Tribal involvement ensures that NDDOT is aware of concerns on reservations, especially regarding State-owned roads that go through tribal land. Years of outreach has led to SHSP updates that include strategies to reduce crashes on tribal lands and across the State, and there are now full-time Traffic Safety Outreach Program Coordinators (funded through federal grants – see http://www.nhtsa.gov/About+NHTSA/Highway+Safety+Grant+Programs for more information) who serve as contacts on two of the State's reservations. Read more about these and other success stories from tribal-State collaboration on the Noteworthy Practices Database website at http://rspcb.safety.fhwa.dot.gov/noteworthy/Default.aspx. The database is housed on the Roadway Safety Professional Capacity Building website, at http://rspcb.safety.fhwa.dot.gov/. The Reliability of Safety Management Methods: Safety Effectiveness Evaluation is the first of a five-part series of informational guides contrasting state-of-the-art methods with traditional methods used in the Roadway Safety Management process. The objective of a Safety Effectiveness Evaluation is to determine how a particular treatment has affected safety performance at the treated location(s). Agencies often use the results of such evaluations in future decisions about allocating funds, changing policies, or in developing crash modification factors for use in computing the expected number of crashes when applying the same countermeasure at a similar site. The roadway safety management process. 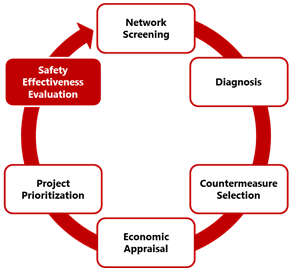 In Reliability of Safety Management Methods: Safety Effectiveness Evaluation, readers will find a concise description of various methods and tools to support their effectiveness evaluations. The objectives of the guide are to raise awareness of more reliable methods and demonstrate their value. Using examples, the guide compares more reliable evaluation methods to traditional methods and describes how to account for bias, including regression-to-the-mean, changes in traffic volume, and other changes over time (temporal trends). The results from methods that do not properly account for potential sources of bias are less reliable and may result in less effective decisions. The examples presented throughout the guide demonstrate the potential magnitude of differences in results obtained from various methods, and reinforce the need to apply methods that are more reliable. Otherwise, the results of the evaluation may be less accurate and less reliable resulting in inefficiency in your decision-making. DDSA Video: The Office of Safety has produced the first in a series of videos on Data-Driven Safety Analysis (http://youtu.be/Lx7sJktkFVA). This video provides an overview of the latest generation methodologies and tools for analyzing crash and roadway data. These approaches enable transportation professionals to make more informed safety management and project development decisions in order to better target highway safety investments and reduce the number of severe crashes on roadways. It also highlights the stories of State and local transportation professionals who have successfully applied these methods at the programmatic and project level. Safety Analysis in Project Development peer exchanges: The DDSA team is preparing to host three peer exchanges for 27 State DOTs and the Federal Lands Highway Division. Over 140 transportation professionals from planning, environment, design, traffic operations and safety will discuss and exchange ideas on the application of predictive methods found in the AASHTO High-way Safety Manual, as well as the benefits and challenges associated with incorporating quantitative safety analyses into existing project development processes and procedures. The peer exchanges will take place May 24-26 in New Orleans, LA; June 21-22 in Sterling, VA; and July 13-14 in Kansas City, MO. DDSA with the Assist: In April, the DDSA initiative surpassed the 100 request threshold for assistance provided since the EDC-3 supported effort began in 2015! So far, 40 States have taken advantage of the FREE technical assistance provided under EDC-3. Requests include training workshops on such topics as the Systemic Safety Project Selection Tool, assessments such as those conducted under the Roadway Data Improvement Program, reviews such as helping to identify opportunities to improve a State's safety analysis procedures, and project-level technical assistance in analyzing an urban freeway's expected safety performance. To request DDSA assistance in furthering your agency's safety analysis efforts, please contact your FHWA Division Office. As one of the initiatives included in the Every Day Counts (EDC-3) program, Road Diets are a low-cost measure that improves safety, calms traffic, and takes into account the needs of all roadway users. A typical project involves converting a four-lane undivided roadway to two through lanes separated by a two-way left-turn lane and using the additional roadway width for dedicated bicycle lanes, parking, or sidewalks. FHWA is partnering with State and local stakeholders to accelerate the advancement of Road Diets as a potential low-cost measure to reduce crashes, injuries, and deaths in busy corridors while improving mobility and quality of life for all roadway users. Policies that encourage Road Diets. Nearly 200 Road Diet projects have been implemented among the organizations represented at this peer exchange. The experience of attendees ranged from a State DOT just beginning to implement its first Road Diet to the cities of Portland, Oregon and Seattle, Washington, which have implemented a combined total of more than 100 Road Diet projects. The participants explored how Road Diet projects can further enhance safety, accommodate the use of other transportation modes, encourage economic development, and improve overall livability along a corridor. Examples of non-traditional Road Diet projects discussed at the peer exchange include one-way streets, divided roadways with raised medians, and five-lane to three-lane conversions. State and local agencies also learned about Road Diet projects that incorporate modern roundabouts to further reduce congestion and increase safety for all users. The design of these projects offers the added benefit of providing space for public art reflecting local community history and values. Participants discussed and shared a variety of Road Diet stories relating to items such as: lane widths, traffic diversion, parking, access management, appropriate traffic volume thresholds, and funding. 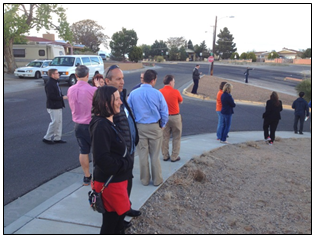 One unique feature of the peer exchange included an evening field trip to completed and potential Road Diet projects. Debbie Bauman, Planner from the City of Albuquerque, facilitated the tour and discussed the various considerations for candidate Road Diets. 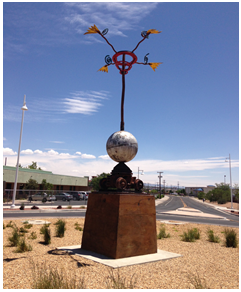 New Mexico's State Traffic Engineer, Afshin Jian, stated the Road Diet peer exchange "was a great learning experience." As the meeting concluded, each participating State made a specific commitment to work towards further institutionalizing Road Diets. Planning for additional peer exchanges is underway for other States wishing to advance Road Diet implementation. If you're interested in receiving Road Diet technical assistance or scheduling a free Road Diet workshop, please contact Rebecca Crowe (rebecca.crowe@dot.gov) or Keith Harrison (keith.harrison@dot.gov) at the FHWA Office of Safety. To learn more about the benefits of installing a Road Diet, visit: http://safety.fhwa.dot.gov/road_diets/. Hosting a Road Diet Peer Exchange on June 8-9 for the New England States. This event will immediately follow the 2016 Northeast Transportation Safety Conference (June 7–8) in Massachusetts. Hosting a Road Diet Peer Exchange in Tennessee for the central States. The Peer Exchange is tentatively scheduled to take place on August 24–25 in Nashville. Providing a Road Diet Workshop in Charlottesville, Virginia, on August 23, 2016, facilitated by the FHWA Resource Center. Deciding Whether a Road Diet is a Good Solution: This webinar will provide information on how to identify candidate roads for Road Diets, feasibility/evaluation criteria, design aspects, and other unique considerations. Public Outreach for Road Diets: How Do You Answer the Tough Questions? : This webinar will focus on ways to educate the public on Road Diets. Presenting on several Road Diet topics and have a Road Diet display at the ITE Annual Meeting on August 14–17, in Anaheim, CA. Staff are also in the process of developing a Road Diet Bicycle and Pedestrian CMF. A Road Diet "Myth Buster" leaflet. A Road Diet Policy flier. A Q & A flier. A Road Diets and Safe Routes to School leaflet. Finally, a Road Diet video that will focus on all the benefits of this proven safety countermeasure is currently under development. The experiences of five states (FL, AZ, CA, WA, and TN) will be highlighted in the video. Please visit http://safety.fhwa.dot.gov/road_diets/ for more Road Diet information and resources, and visit https://www.fhwa.dot.gov/innovation/everydaycounts/edc-3/roaddiets.cfm for more information on upcoming events. The FHWA recently completed two rulemaking processes that affect State Safety Programs (see articles on pages 2-4 for additional details). Final rules were issued for the Highway Safety Improvement Program and for Highway Safety Improvement Program and for the development of Safety Performance Measures. Probably the most significant change is the development of a subset of the Model Inventory of Roadway Elements (MIRE) that are required to be collected on all public roads. The MIRE is a recommended listing of over 200 roadway and traffic elements that are critical to safety management. This listing was developed to enhance a State's ability to use more advanced analytic techniques, such as those in the Highway Safety Manual. The MAP-21 and FAST Act legislation required FHWA to establish a subset of the total listing of MIRE elements to support the HSIP. More in-depth information on the FDEs may be found in guidance used by the Office of Safety at https://www.fhwa.dot.gov/map21/guidance/guidesafetydata.cfm. The FAST Act contains a provision that allows States to opt out of collecting the FDEs on unpaved roads. However, if a State chooses not to collect the FDEs on unpaved roads, it cannot use HSIP funds for safety improvements on those roads. In addition, if the unpaved road is on tribal lands, the State must demonstrate that it has consulted with the tribe regarding the decision not to collect the FDEs on those unpaved roads. States are expected to develop a plan regarding how they intend to collect the FDEs by July 1, 2017. Each State's plan must incorporate specific, quantifiable, and measurable anticipated improvements for collecting the FDEs. Each plan must be included as part of the State's Traffic Records Strategic Plan, which is developed to qualify for NHTSA's Section 405c, State Traffic Safety System Improvement Grants. In addition, the Office of Safety is planning to develop materials and programming to provide more information to agencies about the MIRE FDEs. State and local agencies may also request direct technical assistance for data related issues through the Data and Analysis Technical Assistance Program located on the Roadway Safety Data Program website at http://safety.fhwa.dot.gov/rsdp/technical.aspx. For further information or questions about the FDEs,or the availability of technical assistance please contact Robert Pollack at robert.pollack@dot.gov. In 2016, roadway safety is an impending and critical challenge facing tribal governments. While the overall national trend for fatalities in vehicle crashes is historically decreasing, the number of fatal crashes on Native American reservations has increased over the last few years. The fact that crash data indicate an increase despite a lack of crash data on tribal lands means there is a possibility that those fatal crash rates are actually understated. Without more reliable data, it is difficult for safety professionals to understand the nature of the problem and for tribes to develop effective strategies to respond. On December 4, 2015, President Obama signed a 5-year, $305 billion transportation bill called the "Fixing America's Surface Transportation Act" (FAST Act). The bill passed Congress with broad bipartisan support (House: 356 in favor, 65 opposed; and Senate: 83 in favor, 16 opposed). Within the bill itself are provisions that tribal governments can use to implement transportation safety programs, including resources for applying effective technologies for crash reporting and strategies proven to reduce motor vehicle crashes, save lives, and reduce injuries. The FAST Act also mandates two national reports assessing the quality of roadway safety data in Indian Country. Findings will be incorporated into future policies and initiatives. In general, the Tribal Transportation Program (TTP) will benefit from increased authorizations totaling $2.425 billion over the next 5 years. This funding is distributed to tribes under a formula determined by the FAST Act's predecessor, Moving Ahead for Progress in the 21st Century (MAP-21). In addition to road construction, TTP funds can be used for a wide range of eligible activities, including any transportation project eligible for assistance under 23 U.S.C. that is located within, or that provides access to, tribal land or is associated with a tribal government. This includes virtually all transportation safety activities authorized under Federal law. The FAST Act builds on the legacy of previous transportation legislation by emphasizing data-driven planning and project selection. Tribes continue to have lead responsibility for roadway safety on Bureau of Indian Affairs (BIA) and tribally owned roads. Tribes that invest in safety data collection and program reporting expertise will find funding and support resources that will assist in tribal efforts to save lives and reduce injuries from motor vehicle crashes. Since the remaining Federal safety programs are competitive and designed to direct funds to verifiable safety issues, the TTP funds are the only secure source of tribal transportation funds available. Administered by Office of Federal Lands Highway in the Federal Highway Administration, the TTPSF emphasizes the development of strategic transportation safety plans using a data-driven process to help tribes determine how transportation safety needs will be addressed in tribal communities. The FAST Act did not directly alter the Tribal Transportation Program Safety Fund that was created in MAP-21, although it did increase base TTP funding. (Note: It is possible that changes to HSIP spending criteria (see below) could apply to TTSP spending eligibility, but that interpretation is yet to be determined.) Under the FAST Act, 2 percent of the available TTP funds are set aside each year to address safety issues in tribal communities in the TTPSF (this totals approximately $9.3 million, subject to take downs in FY 2016). The 2016 NOFO for the TTPSF has not yet been published. Additional information on the TTPSF is on the FHWA Tribal Transportation Safety Fund website at http://flh.fhwa.dot.gov/programs/ttp/safety/ttpsf.htm, or contact Russell Garcia, TTP Safety Program Manager, at russell.garcia@dot.gov, or Adam Larsen, TTP Safety Engineer, at adam.larsen@dot.gov. "A traffic safety problem must be identified and all applications must contain measurable targets and performance measures and be justified by data. Insufficient data to justify a traffic safety problem will significantly reduce the possibility of funding for your Tribe." Tribes are urged to look closely at the opportunities presented in the Highway Safety Improvement Program (HSIP). Even in today's difficult fiscal environment, the HSIP has grown significantly. During 2005-2009 SAFETEA-LU authorized the HSIP at $5.06 billion over 4 years, and during 2013 and 2014, MAP-21 authorized the HSIP at $4.8 billion over 2 years. Tribal governments are eligible recipients of HSIP funds available to the States. In fact, each State must provide at least 40 percent of all Federal funds apportioned under the HSIP to be expended by the political subdivisions of the State, including tribal governments. Tribes have to compete at a State level for HSIP funds. One important change in the FAST Act is to remove from eligibility the use of HSIP funds for non-infrastructure safety programs, such as general education and enforcement activities. Many States are using the Strategic Highway Safety Plan process to engage tribes about their participation in State HSIP funding. Visit the FY 2016 Federal-Aid Highway Program Apportionments table at https://www.fhwa.dot.gov/legsregs/directives/notices/n4510802/n4510802_t1.cfm for each state's apportionment under the Fast Act. The FAST Act requires two national studies on tribal safety data be conducted by the Secretary of Transportation. The first, due 1 year after enactment, will examine the quality of transportation safety data collected by states, counties, and tribes for transportation safety systems and the relevance of that data to Native American tribes. Its purpose is to improve the way agencies collect and share data on crashes on Native American reservations. It also requires identification of Federal transportation funds provided to tribes by agencies other than the USDOT and the Department of the Interior. Finally, States, counties and tribes will be provided with options and best practices for transitioning to a paperless transportation safety data reporting system that uses data to improve safety for tribal lands and communities. The second study, due within 2 years of enactment, must identify and evaluate options for improving safety on public roads on tribal lands. Both of these reports are to be developed in consultation with the Secretary of the Interior, the Attorney General, states and tribes. Federal Lands Highway will author these reports on behalf of the Secretary of Transportation and will do so in coordination with the Tribal Transportation Safety Management System Steering Committee. If you are interested in being interviewed during the development of these reports, please contact Adam Larsen, Adam.Larsen@dot.gov 360-619-7751. Removes eligibility of HSIP funds for most non-infrastructure safety programs, such as general education and enforcement activities, which were allowed in MAP-21. Requires the Federal Motor Carrier Safety Administration (FMCSA) to remove safety scores assigned to truck companies from a public website. Requests that USDOT conduct a study on the impacts of marijuana-impaired driving. Prohibits rental car agencies and car dealers with fleets of more than 35 cars from renting vehicles that have been recalled but not repaired. The bill does not require used-car dealers to repair recalled vehicles before selling them. Triples the maximum fine the NHTSA can levy against an automaker that violates safety defect regulations from $35 million to $105 million per violation. Doubles the time automakers would have to retain safety records from five years to ten years. Requires the government to revise the five-star rating system for new cars to reflect not only the ability of a vehicle to protect passengers in a crash, but also whether the vehicle comes equipped with crash avoidance systems like automatic braking and lane-change monitoring. 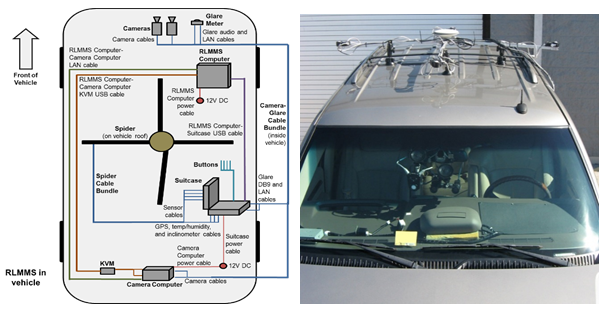 Provides $21 million for research into in-vehicle sensor technology that can determine if a driver has a dangerously high level of alcohol in his or her body and automatically lock the ignition. Congratulations to Frank Julian, recipient of the Howard Anderson Lifetime Achievement Award! The Howard Anderson Lifetime Achievement Award recognizes current or retired Federal Highway Administration (FHWA) employees who exemplify outstanding and significant service to the safety discipline during their careers and leadership through continuous efforts to champion safety both within FHWA and in concert with external partners. Mr. Frank Julian, Safety Engineer, recently received this prestigious recognition. Frank works in the FHWA Resource Center office in Atlanta, Georgia. Over a career spanning 39 years, including 10 years working for State and private sector organizations, Frank has exemplified leadership, innovation, and dedication as a true champion of roadway safety. He is a tireless advocate for the promotion and adoption of leading-edge ideas and good practices. His leadership skills allow him to connect stakeholders both within FHWA and among external partners to advance lifesaving countermeasures on the Nation's roadways. Frank says "without passion for your work it is just a job and I don't need a job." Frank is passionate everyday about saving lives. He has leveraged his expert knowledge and experience in such areas as roadside safety and design, highway-rail grade crossings, and pedestrian safety to encourage implementation, develop design manuals, and assist in project design. This combination of passion and expert knowledge makes Frank a formidable proponent of good practices and great technologies; his advice is hard to ignore. Identifying promising new technologies and promoting their implementation is at the forefront of Frank's priorities. For example, Frank was an early promoter of technologies such as cable median barriers, rumble strips/stripes, Safety EdgeSM, high friction surface treatments, and horizontal curve delineation. All of these have ultimately become Every Day Counts initiatives or Proven Safety Countermeasures–in many cases, both. He has been credited by our partners on more than one occasion for contributing to saving lives in specific locations or areas where his expertise was applied. Two words that describe how valuable Frank Julian is to the Federal Highway Administration safety discipline are "Call Frank". He is committed to his FHWA colleagues and partners. Frank works many hours researching emerging safety treatments and knows how to build momentum for emerging safety measures. Frank knows how to connect research with technical experts in the industry and work with vendors to establish viability for safety products. He has innovative ideas for deploying the latest technologies while still conducting due diligence when moving an idea from concept to standard treatment. For anyone needing help advancing safety in the field, they do not hesitate to "call Frank," and find he usually picks up the phone any hour of the day or night. 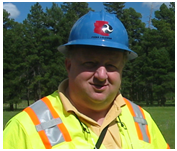 Frank is considered an encyclopedia of information and has become a safety legend in his own right, both within FHWA and beyond. Many leaders in the safety community have been inspired by Frank's commitment, enthusiasm, innovation and dedication. Frank doesn't talk safety, he LIVES safety. For living his passion and making a difference in so many people's lives over a long career, Frank Julian is rightfully recognized with Howard Anderson Lifetime Achievement Award in safety. The purpose of the Second Strategic Highway Research Program (SHRP 2) is to find strategic solutions to three national transportation challenges: improving highway safety, reducing congestion, and improving methods for renewing roads and bridges. In the highway safety focus area, SHRP2 has developed new and comprehensive data that provides a wealth of information about driving behavior, including video and other sensor data collected during crashes, near-crashes, and non-event driving (exposure information). SHRP2 safety data consists of two large databases – the Naturalistic Driving Study (NDS) database and the Roadway Information Database (RID). These two databases can be linked to associate driver behavior with the actual roadway characteristics and driving conditions. To conduct groundbreaking research using the SHRP 2 NDS data and rid that will result in a more efficient, reliable, and inherently safer experience for road users. To advance development of implementable solutions that address high-priority issues among state and local transportation agencies with an emphasis on the broad areas of safety, operations, and planning. To create a venue for highway practitioners to share information and collaborate on research that advances their individual disciplines and addresses such cross-cutting areas as the advancement of a connected-automated highway system. To communicate and work with others in order to leverage research results and to work toward the common goal of a safer and more reliable experience for the road user. A Technical Advisory Committee (TAC) will be appointed to direct the pooled fund activities. The TAC will pursue projects with an emphasis in safety, operations, and planning. The TAC will determine yearly funding allocations for research. Due to the uniqueness of this pooled fund and its cross-cutting approach, the TAC should provide adequate representation of the focus areas in the portfolio of projects. The TAC may pursue activities focused on topics that overlap one or more of these areas. Such overlap may support advancing a connected and automated highway system or other high-priority areas identified by the TAC. The TAC will define the research needs for the pooled fund, select the projects to be conducted, approve research teams, and oversee the work to ensure the objectives are met. FHWA's Safety Training and Analysis Center (STAC) will manage the pooled fund and, with oversight and approval of the TAC, develop work plans to address the TAC's research needs, manage research contracting, and each individual project. Projects will primarily focus on advancing implementable solutions for State and local transportation agencies. This could include development and improvement of countermeasures, development and improvement of predictive models and design guides, policy recommendations, etc. The TAC and STAC will identify appropriate mechanisms for the deployment and implementation of pooled fund results. To support the TAC, FHWA envisions three assessments – one for safety, one for operations, and one for planning – will be initiated at the start of this pooled fund study. These assessments will be used to support the TAC in developing the group's research needs. When appropriate, the selected research efforts will use other datasets that could supplement SHRP 2 data to meet project objectives. FHWA and its contractor the Virginia Tech Transpor-tation Institute (VTTI), conducted a project to study Adaptive Lighting that, along with other products, resulted in a Roadway Lighting Database containing in-situ lighting measurement data for approximately 2,000 miles of roadways across the Nation. This Roadway Lighting Database houses roadway lighting measurements for seven different States. The data collected contains high-resolution measurements depicting horizontal illuminance, vertical illuminance, luminance, and glare (from oncoming traffic and other external light sources) along the roadways during nighttime. States included in the data collection effort are California, Delaware, Minnesota, North Carolina, Vermont, Virginia, and Washington. All of the data is geolocated so that researchers can link it to other datasets, including crash and roadway information. Field lighting performance data were collected using the Roadway Lighting Mobile Measurement System (RLMMS) developed by VTTI. When it comes to roadway lighting-related policies, different State agencies frequently take very different approaches. Some provide continuous lighting on major freeway corridors as a statewide policy. Others only install roadway lighting at locations where complex roadway and/or traffic features are present (e.g., interchanges). There is also an increasing number of States that have adopted the policy of not owning, operating, or maintaining roadway lighting on any State routes. While a number of roadway lighting guides are available nationwide, when facing the "to light or not to light" dilemma, States frequently feel shorthanded when they need to make an informed decision relevant to roadway lighting and safety. Many lighting factors can affect crash risks, such as the level of vertical and horizontal illuminance, roadway luminance, and lighting uniformity. VTTI's Roadway Lighting Mobile Measurement System. Source: Gibbons, R. & Edwards, C. (prepared by Mutmansky, M., Givler, T., Garcia, J., & Clanton, N.). (2010). Advanced street lighting technologies assessment project – City of San Jose. Blacksburg, VA: Virginia Tech Transportation Institute. Previous research on the safety impact of roadway lighting mostly focused on how the presence of lighting affected crash rates by comparing highways with and without lighting and the relationship between day and night crashes (see P.C. Box, "Major road accident reduction by illumination," Transportation Research Record, 1247(1989): 32–38). Such studies lacked the support of detailed lighting measurement data and therefore could not identify exactly what level of lighting is needed to maintain safety. The Roadway Lighting Database contains multi-state scale, in-situ, high-resolution lighting measurements, which makes this database the first of its kind as a publicly accessible resource, giving stakeholders the unique opportunity to conduct a wide range of nighttime safety analyses. The availability of the Roadway Lighting Database also enables further improvement of the current roadway lighting design guidelines by potentially providing critical knowledge relevant to how much, what type of, where, and when lighting should be used. The Roadway Lighting Database is a powerful tool for States during roadway lighting-related decision-making processes at both system and project levels. FHWA is making the Roadway Lighting Database available to public through the Highway Safety Information System (HSIS). Interested users may request the lighting measurement data by State, county, or roadway (for HSIS States only). Depending on the processing time, users may also request lighting data based on lighting levels or latitude/longitude coordinates. Users may submit data requests online at the HSIS data request website (http://www.hsisinfo.org/) or contact HSIS data managers directly using the contact information on the HSIS website. Additionally, FHWA encourages the submission of additional field roadway lighting measurement data by other stakeholders, particularly State and local agencies and individuals conducting work for such agencies to further improve the database. To submit data, users should contact the HSIS team using the contact information on the HSIS website to obtain detailed requirements on data format, contents, quality, and metadata. FHWA recently conducted a state-of-the-practice review to better understand how State DOTs and metropolitan planning organizations (MPO) are addressing safety-related, performance-based planning within their long-range plans. Although this is an internal review, FHWA intends to produce a public report summarizing the results to support DOTs and MPOs in their safety-related performance-based planning. The review includes a baseline assessment for DOTs in all 50 States and the District of Columbia based on their statewide long-range transportation plans (SLRP), and a selection of 20 metropolitan transportation plans (MTP). The baseline will be available to benchmark future progress in considering safety within performance-based planning. The review team consists of representatives from the FHWA Offices of Planning and Safety and the Volpe Center. Initial findings of the SLRP review indicate that although almost every State addresses safety in some capacity in its SLRP, the extent to which States include safety in performance-based planning varies, as do the methods they use for tracking safety performance. Broad findings from the MTP review are generally consistent with the findings of the SLRP review with a few notable differences, such as the greater degree of detail provided by a few of the MPOs studied to describe data sources and monitoring methods. These results suggest that there are opportunities for FHWA to support improved consistency and progress by States and MPOs both individually and as a group. Benchmarking against the baseline for SLRPs produced by this study will help FHWA identify trends and plan for future activities ranging from research to technical assistance. It will also support an enhanced focus on planning oversight and help FHWA identify notable practices among some States and MPOs that can provide model approaches for their peers. In 2013, there were approximately 33,000 traffic fatalities in the United States. Roadway departure, intersection, and pedestrian and bicycle crashes collectively contribute to 90 percent of the total traffic fatalities nationwide. That's why FHWA has identified Roadway Departure, Intersection, and Pedestrian and Bicycle as the three safety focus areas for implementing the focused approach to improve road safety. Speeding, defined as exceeding the posted speed limit or driving too fast for conditions, is a contributing factor in about 30 percent of all fatalities, resulting in nearly 10,000 deaths each year. The percentage of speeding-related traffic deaths has remained largely consistent for many years. Within the FHWA Safety Focus Areas, nearly 40 percent of roadway departure fatal crashes and 20 percent of intersection fatal crashes are speeding related. Although the percentage of pedestrian fatalities that are speeding related is low, travel speed at impact greatly increases the severity of pedestrian crashes. For impact speeds below 25 mph, it is most likely that pedestrian injuries will be slight, but at 45 mph or higher, injuries are likely to be fatal. Integrating a speed management component into each of the three focus areas is essential to reducing fatalities and achieving safety goals. To assist State and local agencies with integrating speed management into their safety policies, plans, and practices to reduce speeding-related crashes as well as to lessen the number of overall roadway departure, intersection, and pedestrian and bicycle crashes, the FHWA office of Safety has recently developed a report that provides speed management strategies for the three safety focus programs. The strategies were developed based on the findings from the investigation of current practices for speed management at State and local levels and through an evaluation of the role of speeding in crashes and safety-critical events. The report resulting from this study provides information on national speeding-related crash trends, promotes a speeding-related crash data analysis approach, and recommends strategies and countermeasures for integrating speed management into an agency's overall policies as well as its roadway departure, intersection, and pedestrian/bicyclist safety programs. State and local agencies should find the information in the report helpful for integrating speed management within the three safety focus areas to reduce crashes. Assist participants in identifying the speeding problem as it relates to the three focus areas of intersections, roadway departure, and pedestrians and bicyclist safety; setting appropriate speed limits; and developing speed management action plans. Teach engineering strategies that are effective in reducing speeding-related roadway fatalities occurring within the three safety areas. The final report, Integrating Speed Management within Roadway Departure, Intersections, and Pedestrian and Bicyclist Safety Focus Areas, is posted on FHWA Speed Management website at: http://safety.fhwa.dot.gov/speedmgt/ref_mats/. The course NHI course will be available beginning in the summer of 2016. Every spring, FHWA partners with the American Traffic Safety Services Association (ATSSA), the American Association of State and Highway Transportation Officials (AASHTO), the American Road and Transportation Builders Association (ARTBA), and other agencies to increase public awareness of work zone and worker safety through a national media campaign. This year's National Work Zone Awareness Week was held on April 11-15, and the kick-off event took place on April 12th in the vicinity of the I-75 widening project just outside Toledo, Ohio. Based on the Bureau of Labor Statistics, there were 116 worker fatalities in and around work zones in 2014, a 9% increase from 2013. The leading cause of death in the road and bridge construction sector is worker runovers, backovers, and falls. These incidents are often preventable if workers are properly trained and follow established safety practices. A series of animated videos following on-site investigations during work zone accidents and incidents available at http://www.workzonesafety.org/data-resources/niosh_face_videos/ was developed under two separate grants (FHWA Work Zone Safety Grant Program and an Occupational Safety and Health Administration (OSHA) Grant). In addition to FHWA-developed products, the FHWA Work Zone Safety Grants Program has generated a wealth of products, publications, and training courses for roadway construction industry practitioners since 2006. More detailed information on each product or resource, including access to the materials, is available at http://www.workzonesafety.org/fhwa_wz_grant. NHTSA Analysis Reporting System (FARS) 2014 Annual Report File (ARF). FMCSA, "Large Truck and Bus Crash Facts 2013," FMCSA-RRA-15-004 (Washington, DC: FMCSA, April 2015). Available at: http://www.fmcsa.dot.gov/safety/data-and-statistics/large-truck-and-bus-crash-facts-2013. Centers for Disease Control and Prevention, the National Institute for Occupational Safety and Health (NIOSH), "Highway Work Zone Safety" at http://www.cdc.gov/niosh/topics/highwayworkzones/default.html. In the winter 2016 issue of Safety Compass, the Highway Safety Information System (HSIS) VI was introduced as the template for the future as we enter the era of big data. Further, by building upon the foundation of linking the best crash, roadway inventory, and traffic volume data for the seven participating States, HSIS is expanding its role within big data by: developing tools, serving as a surrogate for FHWA big data, and streamlining data extraction using next current-generation tools to develop next-generation data. In these three areas, HSIS is starting to depart from traditional data acquisition, management, and delivery to keep pace with the changing computing landscape and to balance escalating costs with shrinking budgets. HSIS is evolving from a traditional data acquisition system into a safety resource that is populated by disparate data sources and is adapting to changing technologies and attitudes on data acquisition and processing. The Geographical Information System (GIS) Processing Pilot Study is an example of this evolution as it uses current-generation tools to develop next-generation data. The GIS Processing Pilot Study demonstrates the means of acquiring, managing, and delivering searchable safety data using spatial data. Traditionally, roadway variables are acquired in searchable data sets, subject to quality control, linked to crash and traffic volume data, and delivered through extract file data requests. The traditional data process is reliant upon the HSIS tabular road file. The new process will populate relevant roadway variables within a spatial environment. The pilot study seeks to create a searchable roadway data file from geospatial data. Traditionally, States have provided HSIS with tabular road log files, carrying a unique segment identification variable, per Figure 1. In States with a spatial road network, agencies created a route event layer, comparable to the unique segment identification variable. 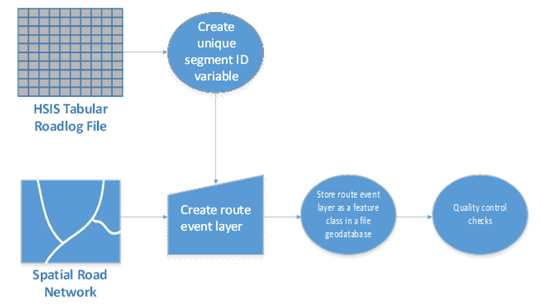 The route event layer was stored as a feature class, populating a geodatabase. These were subjected to rigorous quality controls and made available to requestors as extract data sets for research. Many States are moving to spatial networks that will contain data previously disseminated in searchable data sets. HSIS identified efficiencies by developing critical lists of attributes by State, extracting information from spatial files, and comparing it to existing roadway files. 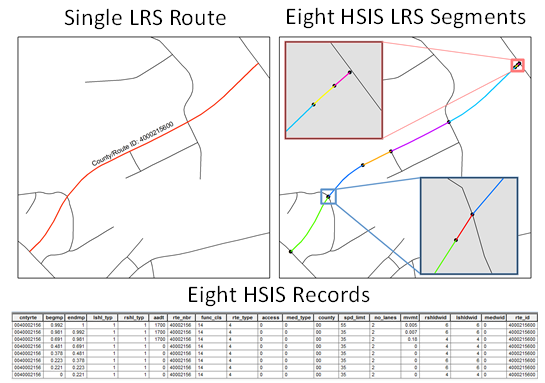 Figure 1: General process for mapping HSIS road log data to spatial network. HSIS has developed a means of replicating a searchable roadway file using spatial file attributes. Using the following steps, a searchable roadway file was created from North Carolina geospatial files. Does file have a unique route or county identification variable? If not, then create a unique road or county identification variable. If so, then create a route event layer, which contains one linear referencing system segment per record in the HSIS tabular file. Does the data set contain linear referencing system (LRS) route features? If not, in the case of North Carolina, a step is added to convert road features to LRS routes. If so, move to route event layer creation. If so, then proceed to comparison with the tabular road log with LRS route features. Do road log and extracted spatial data match? If not, then iteratively review the process. If so, then log record. Specifically, data acquisition, data management, and data delivery underpin how this process works. Currently, tabular road log and spatial data are acquired from participating HSIS states. These result in linked crash, roadway, and traffic volume data. Linked data describe homogenous sections of roadway inventory and crash data as part of the acquisition step. HSIS was able to develop longer homogenous sections based upon a list of critical attributes, thereby making the GIS Data Processing Pilot Study possible. Quality assurance and quality control are necessary steps, whether in the traditional or spatial environments. New QA/QC measures were established by including intra-year/inter-year checks as well as data synchronization. Each year of spatial data must be checked to assure that coding is consistent over the crash years of interest. Data management includes not only making these checks but also synchronizing the data years and deriving variables based upon combinations of variables. This process is needed to avoid internal inconsistencies that might be present in one or more years. Synchronization is particularly important, as segments may have several underlying records, as seen in Figure 2. Figure 2: GIS processing, single linear reference system route, supported by eight underlying records. Finally, data delivery involves the HSIS two-step process to ensure that the request is consistent with the research question. The two-step process begins with a prospective researcher posing a question to HSIS. HSIS vets questions to assure that the requested data will address the research question. If the requested data are relevant to the research question, then an extract data set will be issued, closing the two-step process. Currently, the data are disseminated in Excel or SAS formats. In the future, the data can be made available in Excel, SAS, or GIS-readable formats, with specified crash counts attached to each roadway section. The goal is to adapt and apply this methodology to states that have moved to a GIS platform. The pilot study used Ohio tabular roadway and GIS files to understand if relationships with tabular data can be readily converted to geospatial data for further analysis. The first iteration reviewed years 2009 through 2012, finding no matches between the traditional data and the spatial data. In order to better understand this issue, 2013 data were reviewed. Crashes needed to be individually appended to spatial linear reference system. Not unexpectedly, over 200 spatial and tabular files, coding, and variable names did not match. A tool to convert linear referencing system locations to geolocation had to be used to overcome this issue. In order to verify this methodology, North Carolina became the second pilot State. The same methodology was applied to North Carolina for crashes occurring during the 1999 – 2004 period. In this exercise, the most recent spatial file was matched accurately to the 2014 roadway file. Geographical Information System Processing Pilot Study: What's next? HSIS developed a methodology to extract relevant roadway data from GIS files in order both to stream-line data extraction by avoiding redundancy, and also to explore potential cost savings in data acquisition and cleaning. Ohio served as the pilot State for this exercise because of the high quality of its GIS data and the availability of a roadway file. The pilot results support this methodology. States presenting the greatest geolocation challenges are leading candidates for future application of traditional data processing within the spatial environment using only spatial data from that State. States under consideration for future data set creation based upon this format include California, Illinois, and Maine. For additional developments as HSIS moves from traditional to a big data platform, please see future issues of the Safety Compass. Topics will include creation of an EAR-supported big data surrogate for FHWA, and tool development supporting the creation of synthetic data models. For more information on FHWA's Geographical Information System Processing Pilot Study, please contact Ana Maria Eigen at ana.eigen@dot.gov. Looking back on its first year in operation, the accomplishments of the National Center for Rural Road Safety (Safety Center) include successfully standing up its core services and expanding access to critical road safety resources and training. Sponsored by FHWA, the Safety Center serves local, State and tribal road agencies that operate and manage rural roads. The Safety Center's philosophy is to empower these agencies with the most effective safety tools and strategies that are currently available so they can improve safety, reduce injuries, and save lives. "To accomplish this vision, our short-term goals were to create a useful center, connect with potential users, and to begin to communicate effective methods and strategies for improving safety," said Safety Center Director Steve Albert. "We're proud to say that we achieved all three of these goals." A Digital Gateway – The Safety Center website (http://ruralsafetycenter.org/) is a centralized, easy-to-access resource that contains issue briefs, updates on noteworthy practices by other agencies, a repository of training resources and guidance documents, and a calendar of upcoming training and related events. Less than a year old, the website has had more than 13,000 views by nearly 3000 visitors. Successful Monthly Webinars – The Safety Center has hosted four popular webinar training sessions with presentations by national experts on systemic safety, organizational culture, and rural signage. On average, more than 100 attendees from around the country have participated in each event, and 119 attendees have received Continuing Education Units or Completion Certificates. The webinars are archived on the Safety Center website (at: http://ruralsafetycenter.org/training-education/safety-center-trainings/archived-safety-center-trainings/), so they are easily accessible on an ongoing basis. Original Videos – In order to offer customized, multimedia training options, the Safety Center is developing original training videos. 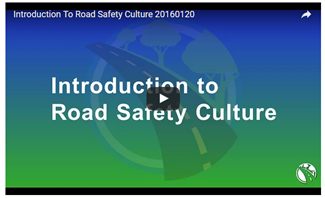 In January, it released its first training video, "Introduction to Road Safety Culture," available at: http://ruralsafetycenter.org/resources/multimedia, which has already been viewed almost 150 times. A second training video on road safety audits on tribal lands is currently under development. National Summit – The Safety Center spearheaded the development of the Moving Rural America Summit, a National working Summit on Transportation in Rural America that will be held in September 2016 in Denver, CO. The summit will bring together stakeholders from around the country and allow the Center and its partners to make a meaningful contribution to national transportation policy and initiatives. Registration for this summit is now open at http://www.cvent.com/events/national-working-summit-on-transportation-in-rural-america/event-summary-c462978995ee4f9b9d9818cf010345e5.aspx. Technical Expertise and Assistance – The Safety Center team offers expertise and assistance on a broad range of safety issues. Over the last year, staff members have been invited to represent the Safety Center at nationally prominent safety and rural transportation forums sponsored by NHTSA, NADO, and the National Operations Center of Excellence. FHWA "Extension" – As an FHWA-sponsored program, an overarching goal for the Safety Center has been to support the development of rural safety resources and extend the reach of FHWA's services. The Safety Center has broadened marketing efforts for FHWA's existing toolkits and training, and it is currently in the process of updating and expanding FHWA's Rural Intelligent Transportation System (ITS) Toolbox and the Road Safety 365 training for local government. These efforts, combined with outreach and training activities, make it possible for FHWA safety resources and assistance to reach more road agencies than ever before. The National Center for Rural Road Safety is sponsored by the U.S. Department of Transportation Federal Highway Administration. It is managed by a team of transportation experts at the following entities: the Western Transportation Institute at Montana State University; the Center for Advanced Infrastructure and Transportation at Rutgers University; the Institute for Transportation at Iowa State University; Cambridge Systematics; IDT Group; and Bubar and Hall Consulting, LLC; in cooperation with the Local Technical Assistance Programs (LTAPs) of Iowa, Louisiana, Montana, and New Jersey. The Arkansas Technology Transfer (T2) Program graduated 33 individuals from its 2015 ROADS Scholar Program. 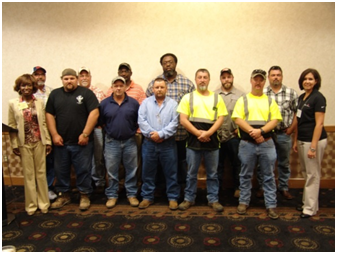 To obtain the ROADS Scholar status, each participant was required to complete a minimum of 24 hours of total coursework during a 4-year period in the Safety or Maintenance & Infrastructure focus areas with a minimum of 10 hours in the Maintenance & Infrastructure category. The new graduates were recognized during a luncheon at the County Judges Association of Arkansas' 2015 Fall Conference. The ROADS Scholar Program is designed to encourage the continuation and expansion of education in the transportation industry. This program provides a mechanism for professional development and recognition for personal growth while delivering valuable knowledge and skills to local agency personnel responsible for the construction and maintenance of roads and streets. Through a diverse selection of classes offered, each participant can choose to advance in both familiar and unfamiliar subjects relating to safety, maintenance, and infrastructure. Remember the collection of laminated pocket guides in the glove box of your work truck providing guidance on temporary work zones and installing roadside safety hardware? Those laminated guides will soon be a thing of the past, at least for the Ohio LTAP Center's customers. Ohio LTAP has made available to its customers three new smartphone apps, replacing those expensive and quickly outdated laminated pocket guides. The Ohio LTAP Center staff felt very strongly that their customers, for the most part, are smartphone users and would benefit from apps providing the same information as the old, laminated pocket guides. The apps are offered free of charge through both the Apple App Store and the Android Store. In addition, the LTAP can update the information in the Apps easily via a download directly to the customer's smartphone. This provides up-to-date information in a just-in-time delivery method–much quicker than republishing a laminated guide and mailing them out. 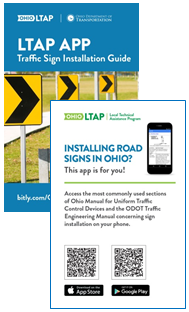 Traffic Sign Installation Guide App – Access the most commonly used sections of the Ohio Manual for Uniform Traffic Control Devices (OMUTCD) and the ODOT Traffic Engineering Manual concerning sign installation. The app includes guidance based on whether the sign is being installed in an urban or rural setting: sign orientation, mounting height, post length, lateral offset, and sign post reflector guidance. Roadside Safety Field Guide App – Quick and easy access to information on proper installation and maintenance of roadside safety hardware. Topics include: Guardrail basics, clear zone, roadside obstacles, barrier types, length of need, additional design considerations, terminals, crash cushions, and maintenance. ODOT Work Zone Pocket Guide App – This pocket guide summarizes specific guidelines established in the OMUTCD. It contains basic principles, a description of the standard traffic control devices used in work areas and traffic incident management areas, guidelines for the application of the devices, and typical application diagrams. Information concerning proper flagging is also presented. To download any or all of the apps, please visit the Ohio LTAP Center's website at: http://www.dot.state.oh.us/Divisions/Planning/LocalPrograms/LTAP/Pages/LTAP-Smart-Phone-Applications.aspx or search for the apps in the Apple App Store or the Android App store. The apps have been very popular with the Ohio LTAP Center's customers and were even featured during a session at the recent Transportation Research Board annual meeting in a session on Innovative Technology Transfer Methods, hosted by the TRB Standing Committee on Technology Transfer (ABG30). The session presentation included information on how the Ohio LTAP Center planned for and developed the smart phone apps using all internal center resources. The Ohio LTAP Center staff believes that smartphone apps are an important way to reach their customers. The roadway maintenance workers and engineers who care for Ohio roadways can benefit from having the information in the palm of their hand when needed. In addition, the Ohio LTAP Center is open to sharing the app. If other public agencies–LTAP Centers and State DOTs–are looking to develop same or similar apps for their States, the LTAP is happy to share the code files for the Ohio apps with them as a foundation to create similar apps for their customers. For more information on the apps or to request the source code files, please contact Victoria Beale with the Ohio LTAP Center at 614-466-3129 or victoria.beale@dot.ohio.gov. On any given commute within the Kansas City or St. Louis metro areas, motorists will see the ever-present dynamic message signs warning of traffic incidents, but also offering accurate drive time information. The system has become a mainstay for urban drivers as they travel along the roadways every day of the week. For major construction projects, the Missouri Department of Transportation (MoDOT) has also deployed several self-contained smart work zones that include portable changeable message signs warning of stopped traffic ahead when congestion builds on the approach to the work zone. These smart work zone systems have become a major tool that can help reduce crashes at the end of work zone queues. Example messages generated by the TransSuite© system. 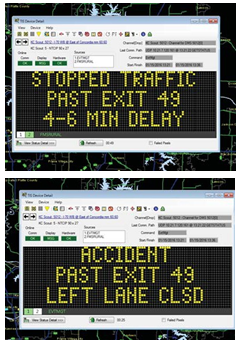 MoDOT's new Rural Queue and Delay Warning System builds upon these two proven tools to automatically format rural dynamic message signs with information that is crucial for motorists. The system, powered by TransCore's TransSuite© Event Management system software,* leverages real-time probe segment speeds that are reported every minute of the day across the entire length of I-70 in Missouri. The TransSuite© system analyzes the probe speeds and compares those numbers to thresholds for either slowed or stopped traffic. Once the low speed threshold has been met, the system automatically formats and posts a single phase DMS board message on the two boards preceding that incident or work zone. This automated message tells motorists if they should expect slowed or stopped traffic, where they should expect to encounter it, and how long of a delay should they expect because of it. Once the traffic management center operator confirms the details of an incident, the TMC executes a response plan and posts the second phase of the message board, which provides even more valuable information to the motorist. The location where motorists should expect to encounter either slowed or stopped traffic is the most critical piece of information, especially along rural interstate corridors where high-speed trucks traveling at 70 mph can suddenly encounter stopped traffic. This speed differential between high-speed interstate traffic and stopped, queued traffic often results in some of the most severe interstate accidents, which are often much worse than the initial incident that causes the slowed or stopped traffic in the first place. The Rural Queue and Delay Warning System, a Best of ITS Heartland Project award winner, has been operational since January 2016 and, to date, traveler feedback on the system has been positive. * The U.S. Government does not endorse products or manufacturers. Trademarks or manufacturers' names appear in this article only because they are considered essential to the objective of sharing information. The new "Human Factors in Roadway Design and Operations" training course (FHWA-NHI-380120) provides information and insights on how road users make decisions. Participants learn why it is necessary to incorporate human factors in the design and operation of roadways as a complement to existing standards and manuals for roadway design and operation including AASHTO's Policy on Geometric Design of Highways and Streets, Manual on Uniform Traffic Control Devices (MUTCD) and the Highway Safety Manual (HSM). The 2-day course also offers a review of specific guidelines, as well as scenario-based case studies that allow attendees to apply the "The Human Factors Guidelines for Road Systems" (HFG) to real roadway situations. Safety professionals (non-engineers): State DOTs, MPOs, counties, local municipalities, and consultants to public agencies. Want to learn more? For more information, visit www.nhi.fhwa.dot.gov/default.aspx. Host a session of this course in your local area! NOTE: Class size is 20-30 attendees. If you think participation might be low for your State, consider inviting agencies from adjacent States. Registration Now Open for National Working Summit on Transportation in Rural America! The National Center for Rural Road Safety, in partnership with the FHWA and numerous national partners, is coordinating Moving Rural America, a National Working Summit on Transportation in Rural America, which will be held September 7 – 9, 2016 in Denver, Colorado. The summit will provide an opportunity for organizations and individuals from around the country to collaborate on enhancing the safety, efficiency, and sustainability of rural roads and transportation networks. In addition to traditional transportation organizations, the summit is inviting diverse stakeholders who recognize that an advanced rural transportation system is an essential component of prosperous rural communities and a vibrant national economy. In contrast to a traditional conference, the summit will encourage broad-based input from all participants, leading to the development of a white paper of recommendations. The program for the Sixth International Conference on Traffic and Transport Psychology (ICTTP2016) is now released and showcases the latest international research, programs, technological innovation and policy to save lives on Australian and global roads. Over 70 countries are currently united in the UN Decade of Action and in accord with the conference theme "UN Decade of Action for Road Safety: The Half-way Point."